Pirate flags come in a large number of different variations. FlagMan.ie have 16 different style of pirate flags for sale in our pirate category. 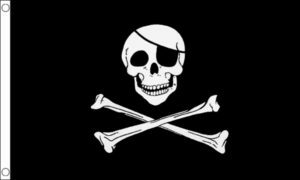 We also have a selection of pirate bunting and hand flags for you to choose from.We have a selection of the infamous Skull and Crossbones flags and Pirate Bandana flag. They are the ideal addition to your boat, in your office party or at home. Our pirate flags come in 5ft x 3ft and have 2 metal eyelets incorporated in the design for hanging. Spooky Pirate Flags for Sale for your party. FlagMan.ie are one of Irelands largest stockists of pirate flags for sale. We pride ourselves in providing you a large selection of flags to choose from at extremely competitive prices. Not only that but we also provide FREE delivery to anywhere in the Republic of Ireland. All our flags are durable and perfect to enhance any occasion or party. If you are in the look out for some pirate flags then look no further. Please feel free to browse our flags and if you do not find what you want then do not worry. Drop us an email to info@flagman.ie or call 059 916 4676 | 085 702 4810 and we will be only too happy to help. In addition, you can view our pirate flags categories here.